What if Max Scherzer Pitched for the White Sox? 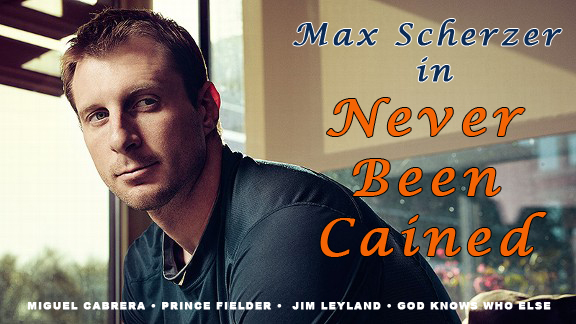 Max Scherzer is having a very good season. This has been the best season of his career, by quite a large margin. He’s missing bats, his walks are down, and he’s turned into one of the best pitchers in the American League. Still, the most important thing to help his case for the Cy Young Award happened four years ago: he joined the Detroit Tigers. Scherzer currently leads the league in wins, with an absurd 18-1 record. He nabbed his latest victory on Sunday when his Tigers topped the Kansas City Royals, 6-3. In fact, Sunday’s game represented Scherzer’s season perfectly. Scherzer pitched eight strong innings, gave up just two runs and five baserunners, and struck out four batters. Meanwhile, Miguel Cabrera launched his 40th homer of the season, four Tigers doubled, and every batter who came to bat for Detroit got at least one hit. This is not an anomaly. The Tigers have scored 626 runs this season, averaging a majors-best 5.05 runs per game. 151 of these runs have come in Scherzer’s 25 starts, giving him an average of 6.04 runs of support per game, the best in the majors. For White Sox starter Chris Sale, July 27 was a representation of his season. On that fateful Saturday evening, Sale tossed a complete game, striking out seven and allowing just one run. The South Siders, however, were completely helpless against Royals starter Wade Davis and his then-5.92 ERA, and the Sox lost 1-0. Sale took the loss, his tenth of the season. This, also, is not an anomaly. The White Sox, despite playing in an extreme hitter’s park, have scored just 460 runs, averaging an American League-worst 3.74 runs per game. 68 of these runs have come in Sale’s 23 starts – an average of just three runs of support per game. Sale has received one run of support or fewer eight times, which, not surprisingly, has turned into seven losses for Sale. This is what we in the Giants fan community refer to as getting “Cained,” after our own talented-but-unlucky Matt Cain (who, for instance, went 8-14 in 2008, while getting one or zero runs of support ten times). The Tigers, on the other hand, have never failed to score for Scherzer. They scored one run just once, which resulted in Scherzer’s only loss of the season. Pundits for the significance of the pitcher win often say that a pitcher knows how to “pitch to the score,” or that hitters will be inspired by excellent pitching to support their pitchers. So, how common is it for a great pitcher to receive such excellent run support? Let’s look at some past AL Cy Young Award winners (average run support in parentheses). Receiving such ample run support is, in fact, really rare. Even in the “steroid era,” only Barry Zito came close to Scherzer’s 6.04. The level that Scherzer has received this season really is historic. The problem, of course, is that neither pitcher has any influence into how many runs their team scores for them. For a completely unscientific look at how Scherzer’s sparkly record would look on another team – say, the White Sox – let’s see how Mad Max would have done with Sale’s run support (Sale has made two fewer starts than Scherzer, so I’ll just use the average of three runs per game). This does not include exactly when the teams scored the runs, or how the bullpens affected the outcome, but should give you some idea what each pitcher was working with. WHAT IF MAX SCHERZER WERE ON THE WHITE SOX? What you see here is Scherzer winning most of his great starts, but taking a loss essentially every time he slips, like most pitchers. Now, let’s see how Sale would have done if he had made the wise choice to have the best run support in the majors. WHAT IF CHRIS SALE WERE ON THE TIGERS? Bizarro-Sale, shown above, would look like an almost perfect player. The run support would cover up Sale’s few mistakes, and he would be an easy favorite for the Cy Young Award. Max Scherzer is having a very, very good season, particularly in terms of his extraordinary consistency. He’s taken everything the Tigers have given him and run with it, leading the pitching staff while Justin Verlander has an uncharacteristically bad year (by his lofty standards). Still, the Tigers offense has bailed Scherzer out the few times that he’s been off his game and made him look like a superstar. Give him average run support and he becomes simply elite. Give average run support to Chris Sale and he becomes Pedro Martinez. Scherzer will likely be a strong candidate for Cy Young Award this year, as will Sale. I just hope that if he wins, it’s because of his actual dominance and his accomplishments, not because of what his teammates did while he was on the mound. This article was originally published on The Platoon Advantage.